Tickets are now available for our annual fundraising gala We Believe: Let’s Move Forward Together 2019, featuring Keynote Speaker Pierre Asselin, Emcee and Live Auctioneer Danny Hooper, and International Performance Poet Titilope Sonuga! Pierre Asselin is an Edmonton lawyer who made headlines in recent years when he successfully fought to have a publication ban removed from his identity so he could speak out about his experiences of childhood sexual abuse. 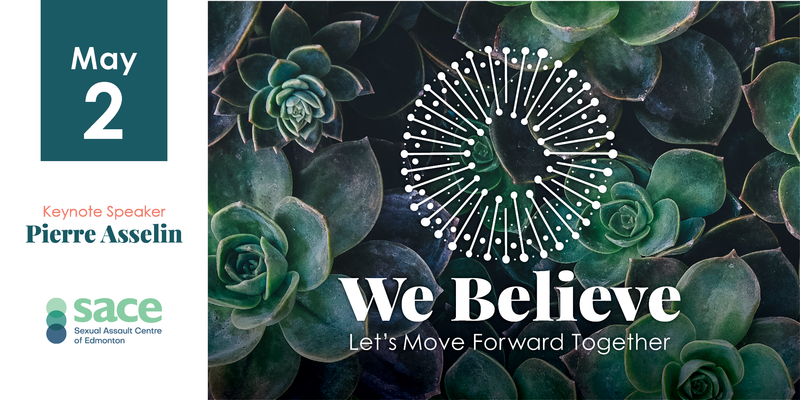 At We Believe: Let’s Move Forward Together, Pierre will be drawing on his personal experiences as well as his pro bono work with those who have experienced sexual assault, to deliver a unique perspective on how we can work together to support survivors as they navigate the criminal justice system. Titilope Sonuga is a writer and performer who calls Lagos, Nigeria and Edmonton, Canada, home. The recipient of the Canadian Authors’ Association Emerging Writer Award, and a 2015 Open Society (OSIWA) Foundation Resident Poet on Goree Island, off the coast of Senegal, she is a leading voice in local and international performance poetry communities who has travelled extensively as a poet, and facilitated poetry workshops across the world. She is the founder of Edmonton’s Breath In Poetry Collective. Her collection, This is How We Disappear is forthcoming in April 2019. Join us May 2, 2019 in Hall D of the Edmonton Convention Centre for an evening of fine dining, exceptional entertainment, inspiring stories and incredible raffle and auction prizes. All funds raised from this event will go directly towards providing essential support for people and communities impacted by sexual violence. Let’s move forward together!